The Puyi White Sideboard Cabinet - PY01 - belongs to the Decor8 Oriental White Wood Furniture Series. The PY01 White Wood Sideboard Cabinet is a Chinese inspired white sideboard living room cabinet and console cabinet made of solid wood and finished in a modern white color. Using traditional Chinese furniture making techniques, carpentry and finishing methods, this White Wood Sideboard Cabinet is the perfect white Oriental Furniture accent piece for any modern Asian inspired or fusion themed interior. 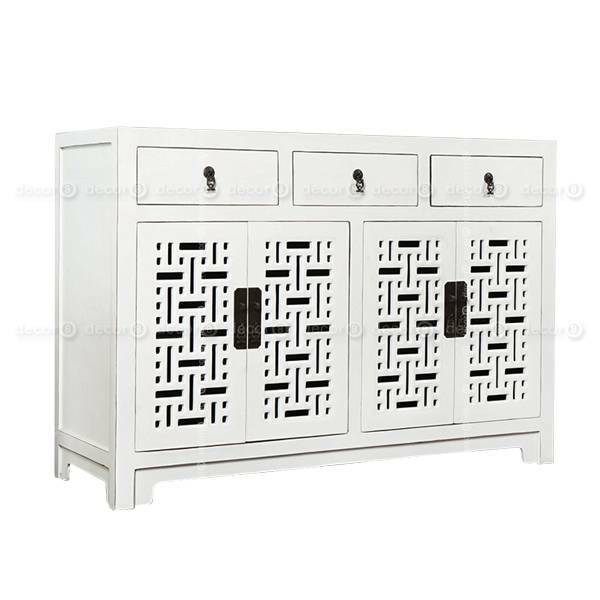 A stunning white furniture centrepiece, this Chinese Style White Wood Furniture piece is the perfect storage cabinet for any area of your home. Fine hardware details complete the look. The PY01 Puyi White Sideboard Cabinet is an exquisite console cabinet that works well for many interiors. Very versatile and graceful design that suits various interior settings.